What drives the team at Huufe is supporting the equestrian community and giving it the app it has been waiting for. We thought that most every other sport had really cool apps and the horsey community was missing out. So, we started with horse riding activity tracking and combined this with an equine social media platform so that we, as riders, could share our achievements with our friends or the wider world. Then we asked fellow riders what they thought, and they came up with loads more great idea. Features to make their horsey life better or easier. So, we added them too! In short Huufe is The Horse Riding App. So, who is this for? It is our aim that Huufe will be the best horseback riding app available. The best dressage app, best eventing app, best cross-country app, best hacking app, best western riding app (you get the picture!). It can be used in all forms of equestrianism. Track and capture your rides with pictures, videos and stories. You can add pictures and videos during rides. Build your own profile with your rides automatically added to your activity feed. Share your horsey achievements with your friends and followers. Follow other equestrians and professional’s profiles and see all their equine activities. Create horse profiles and manage your horsey admin with the Stable Management feature. Build your network by joining clubs and groups. Find groups and clubs that inform your equine passion – locally or wider-afield. Or create your own group to enhance your local club, equestrian community group or business. Discover new places to ride and share routes and trails with your friends. Every ride can be saved as a route and shared with your friends and followers. Examine your horseback rides and analyze your equestrian performance and training progress over time. Post & browse classifieds. The Huufe Marketplace is a free dedicated equestrian classifieds platform. Nothing but horse ads, tack for sale, equestrian services, rugs, trailers… everything equestrian. Browse for all your horsey needs or create and post your own stunning classifieds for free. Ride and explore with live tracking. Whilst out hacking Huufe LiveRide can share your location in real time with nominated friends and followers. Detect falls and notify nominated contacts. If you have a fall whilst riding alone, Huufe SafeRide lets your nominated contacts know that you have had an accident, via text message. Ask for (and get) more and better features in the future. Huufe will continue to ad features that are asked for by the Huufe community. This is just the beginning!! Huufe is for all equestrians, whether you’re interested in eventing, showjumping, dressage, endurance, trail riding, cross country, barrel racing, endurance, reining, western riding, hunting, driving, show jumping, cutting or just happy hacking, you’ll be able to enjoy Huufe. So Huufe is for all kinds of pony and horseback riding. As an activity tracker, it captures lots of really useful information about your ride. You can see and analyze all your training history and track your equine fitness program. We are going to have some more amazing analysis available soon too. Starting with gait analysis. Huufe can track rides when other riders are exercising your horse for you (so now you can track your horses’ activity whilst boarding or in livery). 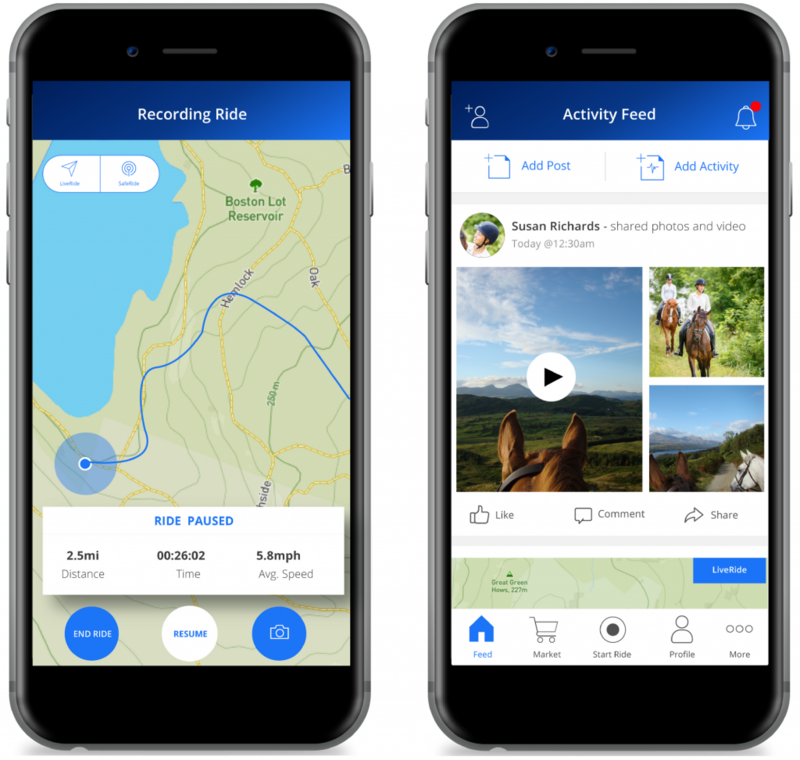 Or you can just keep a great record of all of your rides with pictures and videos to remind you of the wonderful time spent out on horseback ? What makes Huufe really different is that it is also a dedicated equestrian social media platform. Like your favorite sites but completely horsey! Your personal profile is where you keep all of your equestrian information, rides, pictures, videos, posts & thoughts. You can share this with many followers or keep it just to yourself or a few close friends – it is up to you. Now your moments in the saddle are easily captured and shared with your equine network. In turn, you can also follow your friends and your heroes. See their rides, their horses and their triumphs. Another social feature is Huufe Groups. You can find groups and clubs that inform your equine passion. Group members can share their activities, posts and thoughts, arrange events, seek or give advice. Or you can create your own group to help your local riding club, equestrian community group, business or just for your friends. Horse owners also get to give their Horses their own profile. This horse profile not only captures their activities, it can capture all their important admin information. This important and sensitive data can only be shared with trusted administrators, and only if specifically nominated. The Horse Profile links into your Stable Management feature. This is a horse diary app where you can add automatic reminders for vaccinations, worming, farrier visits and other important events. Helping you to manage the day-to-day administrative tasks and maintain an equine digital record – all easily accessible in one place. The Stable Management feature also keeps the details of your farrier, veterinarian and other equine service providers readily available. You can also link to their profiles. Lastly, Stable Management is where you get to nominate who can ride your horse and who can administer it. With accident notification and location tracking, it is perfect for lone riders or children out hacking. Whilst out hacking LiveRide shares your location in real time with nominated friends and followers, allowing you to safely explore the countryside or share a special experience in real time. SafeRide is a cutting-edge safety feature. It lets your nominated contacts and loved ones know if you have had an accident, via text message. The message shows your exact location offering your contacts the information they need to assist you. As a rider you can enjoy the confidence knowing that help is close by, should you have a tumble. Lastly, but not least…. Classifieds! Browse the Huufe Marketplace for all your horsey needs or create and post your own classified ads, for free! With specific categories for equestrian sales (Clothing, Horses, Horse Care, Equestrian Services, Stable Management, Tack & Saddles, Trailers & Horse Boxes) as well as Location and Price Range filters, we think it is the best equine classifieds service available. But we’d love to know what you think. This is just the start! We are now asking you to give us your ideas. What would you like Huufe to do? It’s your Riding App – take it where you want it to go.